My Friday Friend this week is Julie Arduini. She loves to encourage readers to surrender the good, the bad, and —maybe one day—the chocolate. She’s the author of the re-release, ENTRUSTED: Surrendering the Present, as well as the sequel, ENTANGLED: Surrendering the Past. She also shared her story in the infertility devotional, A WALK IN THE VALLEY. She blogs every other Wednesday for Christians Read. She resides in Ohio with her husband and two children. Learn more by visiting her at http://juliearduini.com, where she invites readers to subscribe to her monthly newsletter full of resources and giveaway opportunities at JULIE ARDUINI: SURRENDER ISSUES AND CHOCOLATE and the weekly e mail. SUNDAY’S SURRENDER AND CHOCOLATE. You can connect with Julie on Facebook: http://facebook.com/JulieArduini and Twitter: http://twitter.com/JulieArduini. 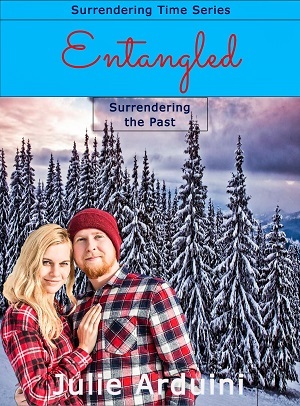 She’s giving away a print or e-copy of ENTANGLED: Surrendering the Past. All you have to do is leave a comment and you’ll be entered to win. Winner will be announced next Friday, July 29. YOUR TURN: Don’t forget to leave a comment and you might win ENTANGLED! Don’t know what to say? Tell us about your favorite summer activity or whatever’s on your mind! Thanks! My main activity this summer is write, write, write, and spend a little time reading. Maybe my next read will be Entangled. I’m there with you, Lynne! I hope Entangled will be your next read. Thanks for stopping by! That’s my husban’s favorite activity too. He loves to fish! Me not so muc. Fishing was something my dad enjoyed. I can never stay still. Or quiet. 🙂 Thanks for commenting, Jan. Happy Fishing! Kathleen, you are so sweet. Thank you. You helped make Entangled what it is. I am forever grateful. I would enjoy reading this – we may visit Speculator next month! Cynthia, I’m so jealous. It is my favorite place. Truly. I can’t wait to go back there. Thanks for reading! Love Julie’s Surrender Series. Her first-person books are lively and invite the reader to an entertaining and fun read. My favorite summer activity is walking, being out-doors, and attending my grandsons ball games. Love summer, my favorite time of year. Thanks Marie. Those sound like fun things to do. Aw, Marie, thanks. Your great eye has helped my books more than I can say. I love your summer activities! Janet, I never thought of going to NM to cool off. This Ohio girl thinks Texas and NM are hot! I’m like Lillian. I’m in Ohio barely hanging on in this heat/humidity. I never thought about NM! Thanks for stopping by! Gail! So happy to see you here. I am looking forward to autumn as well. Summer has not turned out like I thought! I think you will enjoy Entangled. Best wishes!